GloNAF (Global Naturalized Alien Flora) is a living database project about alien plant species and became a synonym for many related projects dealing with all kinds of scientific and policy relevant questions and studies about alien species (also other taxa) and related data. As always planned we finally published the GloNAF data!!!! 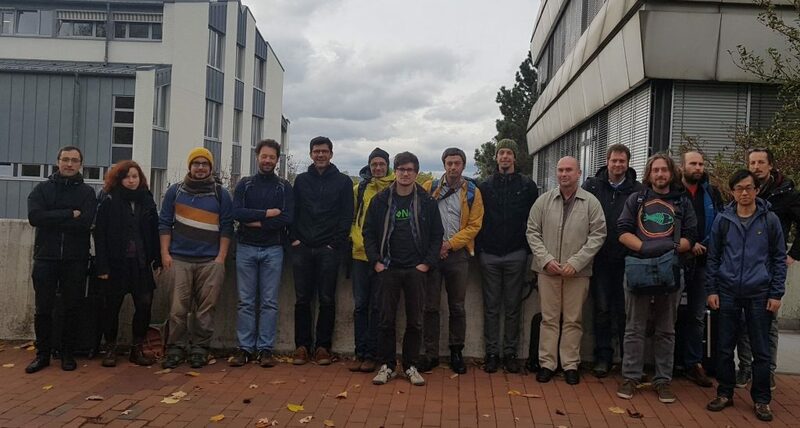 🙂 🙂 🙂 This is a major step for us and the whole project towards an even wider use of the most comprehensive global database on alien vascular plants. Please check our news here. CALL: We now call for experts to check the data and contribute new data. If someone identifies a potential mistake, has naturalized plant lists for regions that are not yet included in GloNAF version 1.2, or has more recent plant lists with information on naturalization status for regions that are already included, please, notify any of the other core team members. When you use the data in your publication, we request that you cite this data paper. If GloNAF is a major part of the data analyzed in your study, you should consider inviting the GloNAF core team as collaborators. If you plan to use the GloNAF dataset, we encourage you to contact the GloNAF core team to check whether there have been recent updates of the dataset, and whether similar analyses are already ongoing (there is a lot ongoing with the data and before you start redundant efforts just ask :O). The idea for the Global Naturalized Alien Flora (GloNAF) started to develop in November 2011, after some of us realized that researchers still had to use jaggy and incomplete data on global aliens species richness. Initially, it aimed at bringing together data on the number of naturalized alien vascular plant species in different parts of the world. Soon the aim was upgraded to bringing together inventories with the identities of the naturalized alien vascular plant species. During three years (without any funding), the core GloNAF members , searched the internet for naturalized plant inventories, contacted taxonomists and invasion biologists for such inventories, digitized these species lists, and standardized the taxonomic names. In 2015, GloNAF version 1.1 was born. In 2015, the project also got funded for a 3-year period by the German Science Foundation DFG and the Austrian Science Foundation FWF. This will allow us to update and expand GloNAF, and most importantly to further analyse the data. on the globe as a result of human activity. 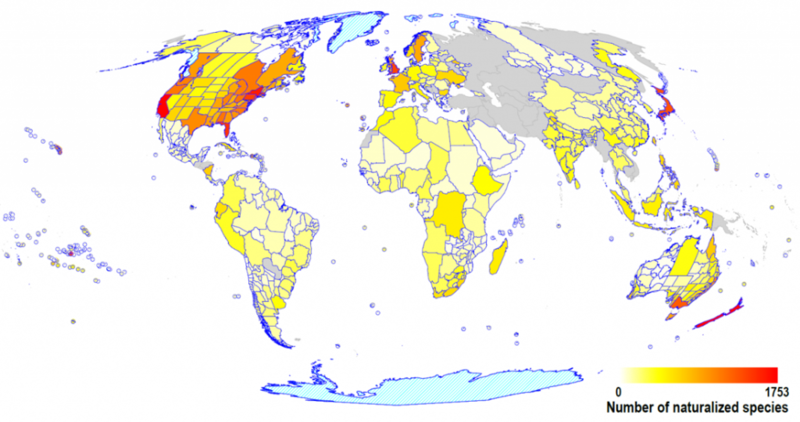 Fig 2: Map of the world showing the 1029 regions included in the GloNAF database, version 1.2 (note the data behind this map are different to the other figures due to updates in GloNAF since the 2015 paper -> its even better now! :O). Small islands and island groups are represented by dots to increase visibility. Regions in yellow likely have very incomplete naturalized plant inventories, regions in orange likely have incomplete inventories, and regions in red likely have nearly complete inventories (see Table 2 in database paper). For the areas in grey, GloNAF does not have naturalized plant inventories. The permanent ice sheets are shown in white with a cyan border, and are from ESRI basemaps. The polygons for the GloNAF regions are provided in the Ecology database paper. North America has the largest number of naturalized alien species, but when one considers the areas of the continents, the degree of naturalization is of similar magnitudes in Europe and Australasia. The Pacific Islands, however, have given their small area, the highest numbers of naturalized species per unit area. Fig 3: Observed flows of naturalized alien plant species among the TDWG continents. The continents are ordered according to decreasing importance as sources. Only the 50% most important flows are shown. Ant., Antarctica (n 5 293 native species); C, only known from cultivation or novel hybrids (n 5 97 species). Each tick along the outer circle corresponds to 1,000 species. 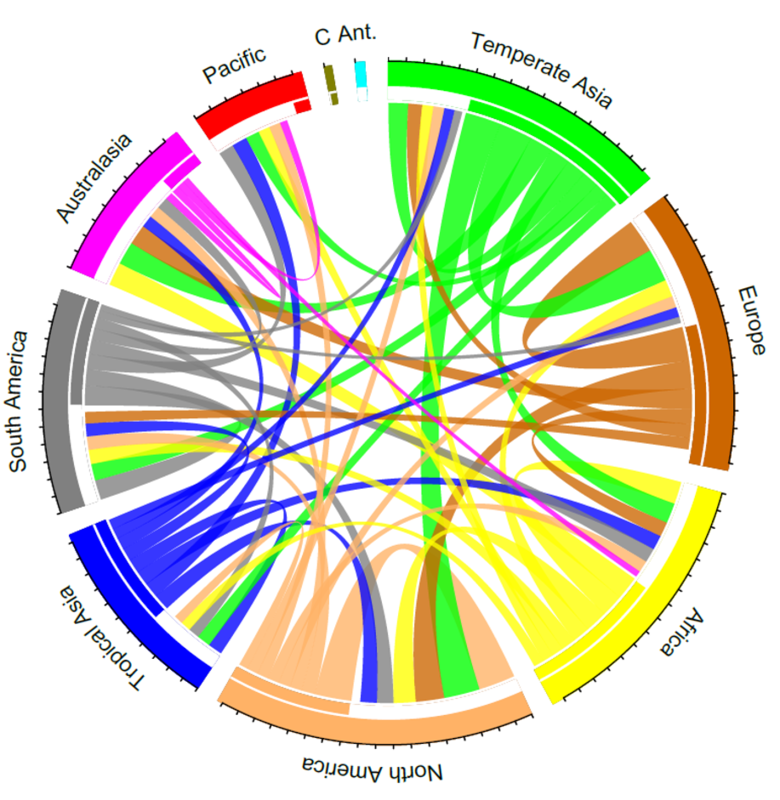 Left (white) parts of inner bars along the circle represent flows of imported species; right (coloured) parts represent exported species.